Some of the available genetic evidence (such as chromosome polymorphism in lentil, chloroplast DNA polymorphism in barley, sibling species in tetraploid wheats, the nature of the loss of wild-type seed dispersal and germination inhibition) already appear to be highly indicative. Taken together with the floristic information on species composition, they suggest that at least emmer wheat - the most important crop of Southwest Asian and European Neolithic agriculture - as well as pea and lentil (the main legumes) were each taken into cultivation only once, or at most only very few times. Evidence pertaining to the mode of origin of einkorn wheat, chickpea, bitter vetch and flax is much more meager, yet the data seem to be compatible with the notion of a single origin in each case. Only barley, where two different non-shattering genes (bc and bt) have been discovered (Takahashi 1964), is there an indication that this important crop has been taken into cultivation more than once. 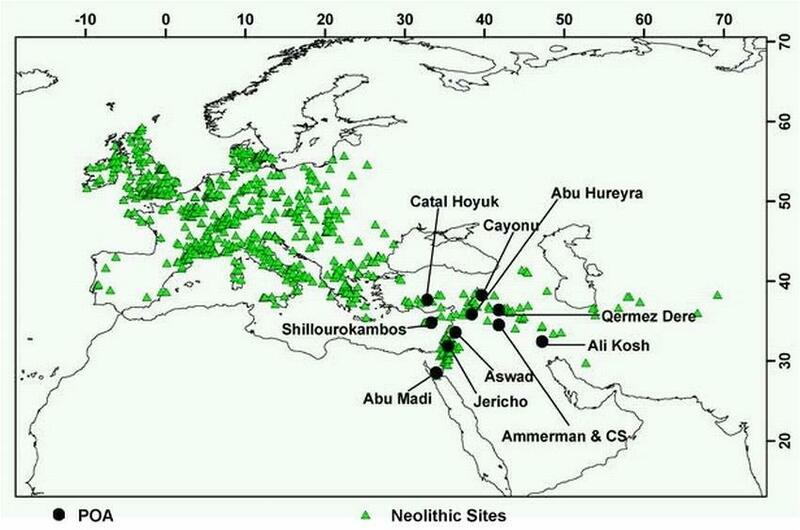 Yet even here the chloroplast DNA data suggest that only very few events have occurred. In conclusion, the available data, fragmentary as they are, appear to support the hypothesis that the development of grain agriculture in Southwest Asia was triggered (in each crop) by a single domestication event or at most by very few such events. 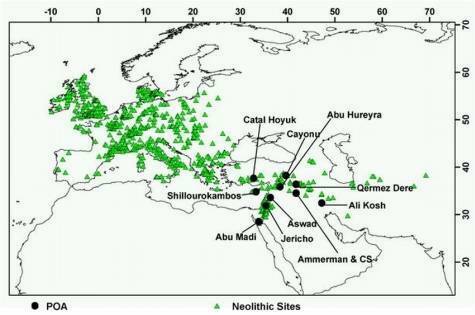 However, although such mode of origin is indicated for the majority of the founder crops, the data tell us very little about the way the Southwest Asian Neolithic crop package was assembled. It remains an open question whether these crops were taken into cultivation together in the same place, or whether different crops were domesticated (perhaps each only once) in different places. Yet once the technology of crop cultivation was invented, and the domesticated forms of wheat's, barley, pulses and flax first appeared, they probably spread over the Near Eastern arc in a manner similar to the way in which they later spread into Europe: not by additional domestications in each species but by diffusion of the already existing domesticates. In other words, soon after the first non-shattering and easily germinating cereals, pulses and flax appeared, their superior performance under cultivation became decisive and there was no need for repeated domestication of the wild progenitors. Moreover, because this new system of crop cultivation expanded rapidly, there was little chance for grain agriculture to develop independently elsewhere in Southwest Asia or Europe. This is apparently true not only for the Neolithic founder crops but also for the first Southwest Asian domesticated herd animals: sheep and goat (cf. Uerpmann, Legge and Hole in Chs 12, 13 and 14 in this volume). 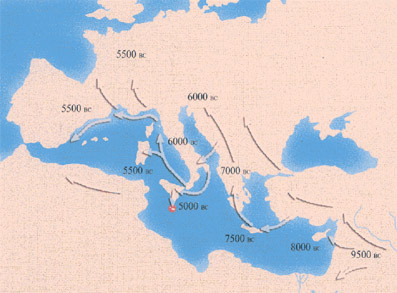 The map above illustrates the first principle component (PC) of molecular genetic variation in Europe, suggesting demic diffusion from Antolia, probably associated with the spread of farming. The range between the maximum and minimum values of the PC has been divided into eight equal classes, which are indicated by different intensities of shading. The direction of increase of PC values is arbitrary. 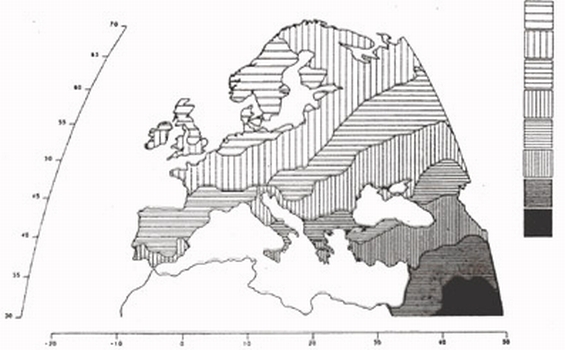 From Tracing the Origin and Spread of Agriculture in Europe by Ron Pinhasi, Joaquim Fort, Albert J. Ammerman. Domestication of plants and animals supposedly began as early as 11,000 years ago in the Fertile Crescent of the Near East (light brown area below). Two thousand years later it began in the New World in the highlands of Central America. This is puzzling because crops grown at altitude are much more labour intensive than in valleys. Also the technological leap from wild grains and grasses to useful foodstuffs has not been duplicated by modern botanists. No useful domesticated plants have been created for the last 5,000 years. So how did Stone Age hunter-gatherers living in mountains decide to miraculously converting wild grains and grasses into edible foodstuffs? As with megalithic structures, it seems highly improbable that ordinary humans could have done it. A main concern in Lebanon is that of earthquakes as the area is in an active region. Beirut has been destroyed many times by earthquakes and tsunami (tidal waves), most notably in 551 AD. Lesser quakes have occurred since. Even small earthquakes may have triggered landslides. A subtler hazard is that of soil erosion. The steep slopes of Lebanon and the high rainfall means that the soils, in many cases the product of thousands of years of formation, are easily eroded. These soils are not being replaced. Related to this are widespread landslides on various scales due to the steep slopes, wet winters and de-forestation. Geology has largely controlled the history of Lebanon. It has given the region its fertility with the high rainfall and excellent springs. However, this is localised, demands hard work to farm due to the steep slopes, and is easily destroyed. As a result wealth based on agriculture has not proved easy. Many Lebanese have traditionally migrated or gone into commerce. - Project Note - Deposits of sediment and erosion by water will create both problems and opportunities with the geophysical surveys and sediment core sampling required by the proposed research. As far as we know there has not been a full archaeological or environmental survey carried out on the site in the last 36 years. Dissertation research carried out by Lee Marfoe in 1979, who until his death in 2003 was the assistant professor at John Hopkins University and the Oriental Institute/NELC, was concerned with the long-term development of settlement, population and society in the Beqaa Plateau in the Lebanon. We hope that our initial survey, together with available works by others, will encourage a wide range of contributions to add significantly to the knowledge and understanding of site. confirms this, indicating the tenacity of human populations to occupy and settle in post-glacial environments (Holocene).